Please log in with your professional account, then search “Biofreeze” to view our Biofreeze Summer Clearance sale. Biofreeze® Pain Reliever is an effective topical analgesic that provides the benefits of cryotherapy without the disadvantages of using ice. Long-lasting pain relief soothes low back pain, sore joints, arthritis and many other aches and pains. Use it before, during and after treatments like massage therapy, trigger point therapy, rehabilitation exercises, training or stretching. Non-returnable. 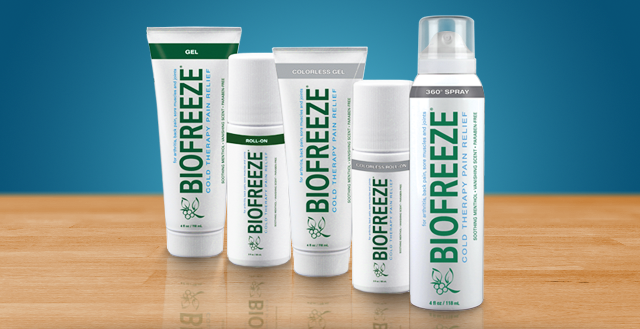 Newly formulated Biofreeze®is the #1 clinically recommended topical pain reliever, decreasing pain and reducing inflammation in minutes. The new formula delivers the same proven strength and efficacy with a more natural ingredient profile. Biofreeze features 4% menthol with natural botanicals, including skin conditioning aloe and vitamin E, and antioxidant-rich Ilex. It’s greaseless, stainless and has a vanishing scent. Use Biofreeze for cold therapy on sore muscles, sprains, back pain, neck pain, sore joints and more. It’s also effective at managing pain associated with arthritis, bursitis, tendonitis or diabetic neuropathy. Apply it to painful areas before, during and after rehabilitation exercises, massage therapy, spinal decompression, kinesiology taping, etc. Biofreeze can also aid in training; apply it before a workout to alleviate muscle soreness and after cool-down to minimize the next-day aches. Fast-acting, deep-penetrating Biofreeze can be applied in three easy ways: rub on, roll on or spray on. Choose from original green or colorless in a variety of patient- and practitioner-sizes. All Biofreeze spray products are colorless. Biofreeze is available exclusively to registered health/fitness professionals. Sign in or register as a professional to purchase Biofreeze.